Topshop Petite White Shirt Size 10 with front pocket. Worn once in good condition. From a smoke free home. Clearing out the wardrobe please feel free to check out my other items for sale. Dusky purple top with ruffle trim on shoulder and diagonally across top. Long sleeve. Cotton/Elastane blend. Great for Spring. From the Topshop Petite range, size 8. [There may be a little bobbling or a few loose threads, but if there are any other larger problems, I will be very happy to help solve the issue MISTAKES DO HAPPEN. Top to Bottom - 18.5". UNLESS OTHERWISE STATED]. Overall Sleeve Length - 17". Top to Bottom - 23". Armpit to Armpit - 16" (overall chest size 32"). There may be a little bobbling or a few loose threads, but if there are any other larger problems, I will be very happy to help solve the issue MISTAKES DO HAPPEN. Blue denim Top Shop tunic/pinafore. Size 12 petite, length from bib to hem 62cm, adjustable straps. One large front pocket, two back pockets and two side pockets. BNWT. Dispatched with Royal Mail 1st Class. Topshop 100% Cotton Embroidered Flamingo Shirt Size 6 Petite White Rare Sold Out. Only been worn once. Oversized boyfriend style. Topshop sweatshirt size 12 petite current season. Condition is Used. Dispatched with Royal Mail 1st Class. 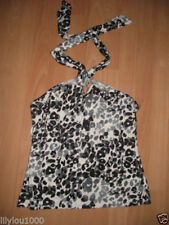 Topshop Grey Top Size 10. Condition is Used. Dispatched with Royal Mail 1st Class. The black is half plain black and half lacy with black panels. Small black button back fastening. The collar is a combination of lacy fabric, edged in black. The front is a lacy fabric with a pretty pattern. In very good condition, beads all still in tact. The top also has a sli ght ribbed pattern in the fabric. To the bottom of the top are splits in the sides. Cotton ruffle / frill strap Vest top. 100% Cotton. Don't miss ! Topshop Stripped Top Petite UK 4. Very light weight, good condition. Any questions please ask. Thanks Dispatched with Royal Mail 2nd Class. A fine Shoestring strap cropped vest top in an aztec style print. Topshop Ladies Short Sleeved Top, Black & White Striped, UK Size 8. Excellent! It is black and white striped with tie up front. Size : UK 8. Wash : Machine wash at 40 °C. Excellent Condition! Short Sleeve. Color : Burgundy. Machine Washable. 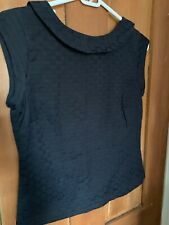 Topshop Petite Womens shirt with check sleeve, size 10. Take a look at my other items. Gorgeous mauve colour with frill detailing. Arm to armpit 16.5" making the chest approx 33". Great with jeans. BRIGHT FLAMINGO PINK ON FRONT. BOLD & BRIGHT! BRIGHT ORANGE / RED BACK. PERFECT FOR THE UPCOMING MONTHS. Light and floaty cotton blend vest top. Soft fabric. Womens Petite Football Jersey. Condition is Used. Dispatched with Royal Mail 2nd Class. Size 10 Petite. 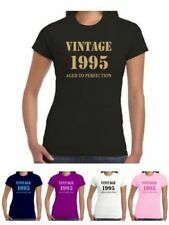 Tee crop short sleeves. Jersey Top. 19" Pit to Pit - Flat across back. STUNNING FITTED PINK COLOURED BODY. MACHINE WASHABLE AT 40 DEGREE WASH. EXCELLENT CONDITION! SMALL ROUND NECK LINE. Red black white large check see photos. 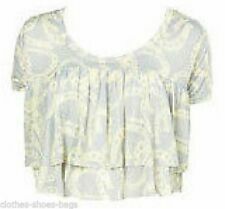 Size 6 Topshop Stripe T Shirt Lace Sleeves. Condition is Used. Dispatched with Royal Mail 1st Class. Good condition. Hem to shoulder: 65 cms.